Sail on the Crystal Esprit and discover its iconic yachting destinations. Book now for savings of up to $2000 per suite! ALL IN PRICE: $5485 USD per guest based on double occupancy for the first two full-fare guests in suite and include port charges of $590. HURRY, OFFER ENDS APRIL 30, 2019! Fares are cruise only, per guest in U.S. dollars based on double occupancy for the first two full-fare guests in suite and include port charges of $590. 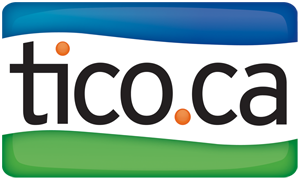 Fares listed are for select categories only and apply to new bookings only made between March 1, 2019 and April 30, 2019 and includes all promotional Book Now Savings. A cruise deposit, an amount which may vary by departure, is required at the time of booking regardless of voyage length (this applies to all Crystal Experiences – Ocean, River, Yacht & Expedition). Book Now Savings are per guest and subject to availability. 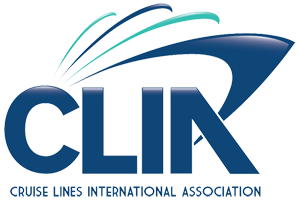 All itineraries, fares, programs, promotions and policies are subject to change at the discretion of Crystal Cruises. Additional restrictions may apply; ask for details. Crystal Cruises reserves the right to correct errors or omissions and to change any and all fares, fees and promotions without notice. Visit CrystalCruises.com for the most updated Terms & Conditions. ©Crystal Cruises, LLC. Ships' registries: The Bahamas. Home to the world’s biggest shopping mall, tallest skyscraper, and dozens of ultra-glamourous luxury hotels, Dubai is truly a modern wonder. After exploring the new sites of the city, find yourself amongst traditional winding souks and local charm. Khasab, a city within the Sultanate of Oman, is increasingly popular tourist with tourists. 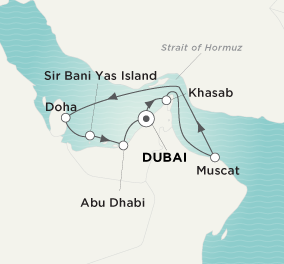 Dhow cruises showcase the inspiring scenery, calm waters are ideal for diving, and dolphins are often spotted frolicking in the sea. Stunning landscapes, high mountain peaks, a picturesque coastal route and stretches of unspoiled beaches highlight the region, while manmade wonders include an old fort that dominates the harbor which, recently restored, contains examples of traditional Omani watercraft. 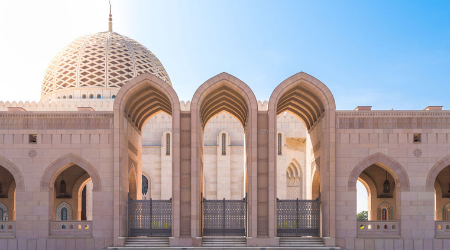 Ringed by volcanic mountains and guarded by two Portuguese forts, Muscat is a picturesque blend of Arab, Indian, African and European styles, thanks to the ordinance that traditional architecture must take precedence over high-rise buildings. 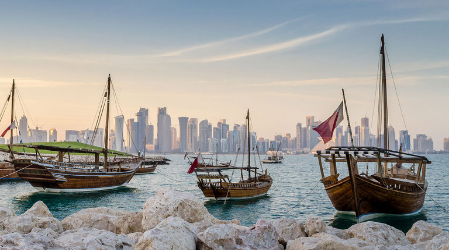 Doha is a major cultural and political hub of the Persian Gulf and is constantly growing. Thousands of expatriates have moved to Qatar to become a part of its development and thriving economy. One of Doha’s most impressive projects is the Pearl, an artificial island that covers 985 acres. Picture an African safari with game drives, nature walks, mountain biking, land sailing archery, horse riding, and exclusive outdoor dining experiences, only it’s on the Arabian Peninsula. Bani Yas Island is home to the Arabian Wildlife Park, a reserve for thousands of free-roaming wild animals. 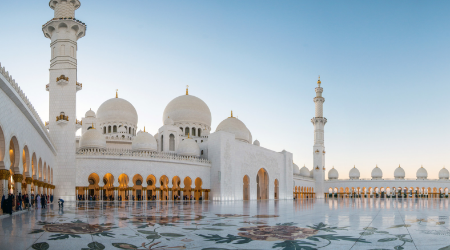 Abu Dhabi is a bustling city with extraordinary sky scrapers, wide, tree-lined boulevards, and some of the most elite cultural destinations. This city is considered the wealthiest city in the world, but still retains a humble charm with its central souk and artisan hub for traditional crafts. Interested in Save up to $2000 on Exotic Yachting Destinations with Crystal Cruises?